Here is the wonderful web site by Kang Leong called London Eater with his marvelous photographs. It lists good restaurants of all genres including Japanese restaurants, some well known others less so. Inevitably some places may change or even close (such as sushicafelicious) so check before going to avoid disappointment. In most countries, and Japan is no exception, most houses are of dubious design merit. So nice to see this friend's house in the town of Hiratsuka down the coast from Tokyo designed by Defenes Inc.
Trust me it's good, my friend Ashihara wrote. I duly did as requested as both the eboshi web site and photographed building looked distinctly average. But when we got there at 11.45am there was already a queue for lunch. We parked our car around the back, where 5 eboshi refrigerated vans were taking a late morning nap and went inside. Good that Ashi was there to order, as the menu, if you can call it that, was scribbled on about 25 separate pieces of A5 paper. Perhaps they're sponsored by a paper-mill. But the food, when it arrived, was great. Even in Japan, you're not going to get fish much fresher than this. Shell fish were a particular revelation, so sweet. And even better was the price; just 3500 yen (~£20) for a generous lunch with draught beer. "In 2005, Don Quijote began building a 'half-pipe' roller coaster on the roof of its eight story Roppongi store. Roppongi is a heavily populated area in the core of Tokyo, and many residents and businesses were upset with the idea of having a roller coaster in their neighborhood because of the spectacle, noise and crowds it will likely create. The project was completed in 2006 but due to increasing pressure from concerned groups in the area it has never been operated. As of 2010, the structure still exists. Don Quijote has not announced what future plans they have for it". Unsurprisingly, there were no trains. The station monitors at Tsukiji were showing rolling news of tsunami carnage up the coast. Most people just stared at the information with disbelief until they pulled themselves away to consider how to get home. Fortunately for me I was a vistor, with a hotel in central-ish Tokyo. My colleague however lived about 25 miles away so decided to sleep at the office. You can see my route home on the map; 16.5 Km door to door apparently but I think the predicted time is not for somebody lugging a computer and carrier bag of trade show brochures. Without doubt, the one positive of the experience was that I realised even Tokyo is relatively easy to get around on foot. After a couple of hours further walking I stopped to rest and looked in a window of a small gallery. There were still a few people inside and they saw me. "Do come in!" they said and gave me a glass of sake. It turned out that it was supposed to be the opening night of a new exhibition. We were expecting about 200 people the man said, but you are the only one. They asked me which painting I liked most. It was Hobson's choice but I pointed at the one positioned centrally, tactically assuming it was not in that prominent position by accident. Then I preceded down to my hotel in Naka-Meguro arriving, shortly after midnight. The following morning I went down for breakfast. All news channels were showing the enormity of the situation, with the foreign channels, skillfully combining the footage with poor quality commentary and bonkers telephone interviews with people desperate to be famous for 5 minutes. Nevertheless it was time to get out and about. My hotel was very close to a branch of the wildly successful discount chain DonQuiote. This is the sort of store that you can only imagine succeed in Japan and perhaps other Asian countries. If you need two tomatoes, a pair of jeans, some obscure imported liqueur and a suitcase to put it all in, then this is the place for you. And on that day it seemed to be the place for everyone to panic buy as the queue was enomous. I made a mental note to come back later (much later as it's conveniently open 24 hours). When I did return in the evening, the shop was still busy. It was fascinating seeing what emergency purchasing priortised; number 1 was loo paper and tissues. It was also interesting to see the volume of emergency purchases, given that a supermarket trolley in such stores is just a hand basket on a trolley frame. I went for cereal (good to see Dorset museli flying the flag out there), some milk and - to balance it out - two cans of beer with some crisps. And that is how the next days continued until I finally departed with all meetings predictably cancelled but a surprisingly stable internet connection. My colleagues had rolling black-outs due to insufficient electricity but in central Tokyo we were unaffected. And once the trains started running again the stations saved energy with jazz-feel soft lighting. I went out most nights locally and found it strange that while the expensive Italian restaurants were still heaving with their Bentleys and Lexus' parked nearby, Don Quiote had long since run out of loo paper, milk and basics. In fact the only thing it had plenty in plentiful supply was the obscure liqueurs. Some things just never sell. Usually it should not have taken long to get back into central Tokyo, but the footbridge was closed for fear of an approaching tsunami. At this stage we had no idea of the devasting effects that would be felt up the coast and thought that the two retired neibourhood volunteers manning the entrance were being over cautious. Strangely they were probably right and wrong simultaneously. Correct to fear a tsunami could approach, wrong to imagine closing it would have had any effect as a tsunami would have taken out the whole of the man-made island we were on, never mind the footbridge. The only way back therefore was via Tsukiji, home of the world famous fish market. It was a beautiful warm evening and as we walked back I tried to send an email home on my colleagues phone to say that 'if anything happened to get on the news, we were fine'. On about the 10th attempt we got the email to send. And that in fact turned out to be the only one we sent as the whole mobile system started to collapse under the weight of outgoing and incoming messages. Walking was much slower with so many people en route but after about two hours we got to Tsukji. Having missed lunch we decided to take a luck at dinner, correctly assuming there would be no trains, wrongly assuming they might restart later. We passed Tsukiji sushiko the 本店 (main branch) of a respected chain of sushi restaurants that I knew from many years back. It was relatively empty at about 5pm so we settled down ordering slowly so we could stay for as long as possible. After what felt like a short amount of time, but in reality about 7pm, we admitted defeat and went to pay the bill. Only then did we realise the queue for the restaurant was now enormous, far longer than on a normal day. A man waiting with his friends for a table had an iphone. I asked him if he could check the BBC web site to see if there was any report of an earthquake. I translate from his Japanese but he basically said, "Buddy, we are in the biggest news story in the whole world. Look at this, BBC, CNN, everywhere, top news news story". Finally we realised that somewhere in Japan it was really serious, yet as we went out in to the warm evening air it looked like an almost normal Japanese evening, with people wondering where to eat and recounting their stories of how far they had needed to walk. The photos above show people walking down the monorail track, after their train had performed an emergency stop between two stations, in Shiodome area of Tokyo. We were all lucky when compared to what happened further up the Japanese coast on 11 March 2011, but at the time we thought they were the unlucky ones. Our monorail train had conveniently performed its own emergency stop in a station. Though the doors opened, at first nobody got out. The train's sensors were far better than a human detection system. And as the earthquake gained force, we all remained in our seats 'knowing' that these things always pass after a few seconds, but then there was a jolt, like nothing any of us had felt before. I can confidently say that none of us had felt such a wave of energy because we all went for the door at the same time, old and young alike. Once on the station platform we looked at the carriage which was starting to bob around like a little boat in a poorly protected harbour when the wind picks up. Then it really kicked in. First there was a sound of metal being pulled in directions it wasn't designed to move in and then the platform, which was a good (or bad) 20m above street level on stilts moved in a way concrete usually doesn't. Each time the earthquake strengthened I thought, "Everything's standing, provided it gets no worse than this we're OK", at which point, naturally, it got worse. As we all know, it did finally decrease. In our area, the earthquake left little evidence of its awesome power. What amazing engineering. Our pasta arrived with two large glasses of red wine to calm the nerves and I had just taken my fourth mouthful (my colleague, her first, being slow) when there was an impressive aftershock. We all rushed out and looked at the nearby Suntory HQ swaying like a tree in the wind. Unfortunately for my pasta we weren't allowed back in the restaurant, as the building behind caught fire at that point. The head waiter was profuse with apology in a way that perhaps only the Japanese could, saying that of course that we did not have to pay, how sorry he was that their gas had been cut off due to the building behind going up in flames and how delighted he would be to see us another time. And so began the slow walk towards central Tokyo, with the thousands of others who had evacuated their offices. Is it true Harry Kidnap will be next England manager? Just back from a month in Japan. Credit where it is due, nowhere does restaurants like Japan. Huge city populations and a tendency to eat out regularly creates stiff competition. This attractive fast-noodle restaurant, serving mainly the large white udon type was recently featured in an architecture magazine, yet the average spend per customer for this successful chain is only 580 Yen (£4.67 at today's exchange rate). If we could get this quality in the UK for such prices, eating out would be revolutionised. What a surprise. Next Wednesday we're catering in London for a charity event at One Mayfair (formerly St. Marks Church) a well known party and promotion venue. Apparently this will be the first event at the venue since last night's UK lingerie awards where (just to prove that fact is stranger than fiction), Atsuko Kudo won Innovative Brand of the year. Not heard of her? She is the designer who clothed Lady GaGa in this fetching red latex creation for meeting Queen Elizabeth II. Let's hope Wednesday is as exciting. What on earth is kinpira we hear you ask. Well, essentially you take matchstick sized pieces of carrot and very briefly stir fry them in sesame oil and Japanese red pepper flakes. Then as they cool add a tiny bit of soya sauce. Surely all children would eat carrots if they tasted like this. Once fully cooled, the carrot kinpira is used as a norimaki filling. Our stall should be looking rather elegant this year thanks to decorations from Radziwill Studios. Their exclusive hand painted glass decorations will be taking centre stage on our table, with our sushi to the left and matcha chocolat's delectable offerings to the right. Though we often associate decorations with Christmas in this country, these hand painted glass decorations look beautiful all the year round. Come and speak to the owner of Radziwill who will be helping us on the day. Oundle Food Festival this Saturday - Sushi & MatchaChocolat. In addition to Yuko's demonstration at the Oundle Food Festival this Saturday we will have a small stand in the market place. But as all our sushi is made on the day, we can only supply a limited volume. So we will also be supplying some exclusive chocolates from MatchaChocolat in Oxford. Bored by typical chocolate flavours? These will reactivate your taste buds. Already winner of a Great Taste Award, the chocolates have unique flavours such as Japanese Yuzu (the missing quadrant of orange, lemon and lime), Jasmine, Green Tea and many others. Remember the food market ends at 2.30pm so make sure you get there early to avoid disappointment. 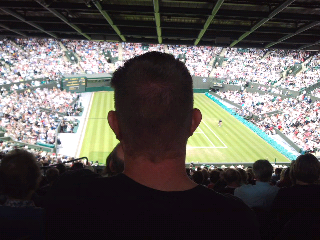 Day off and we are at wimbledon watching laura robson take on shrieking sharapova. I have enormous man in front who needs 1.3 seats but thankfully slim ladies on either side. Sharapova is serving faster and faster as time goes by judging by the decibels of her shrieking - and we're on the back row. Osaka Waste Facility modelled on Lego and Disney? Here is the world's most funkadelic refuse plant. It looks like a collaboration between Lego and Disney. Must be a cool place to work eh? Now let's look inside. Doh! It's those Japanese boiler suits again, going nicely with the in-house slipper sandals. I was hoping for pointy hats and clown shoes. This weekend we are catering for the preview of Ken Matsuzaki's new exhibition of ceramics at the Goldmark Art Gallery in Uppingham. Matsuzaki is considered one of the foremost ceramicists of his generation. See http://www.modernpots.com/ken_matsuzaki.php for some fascinating video footage of the vast kiln, fired just twice a year, due to the incredible effort required over a sustained 7 day period. This exhibition is particularly poignant as Matsuzaki's hometown of Mashiko, a centre of cultural significance and home to hundreds of artists was devastated by the earthquake. Pieces on show were shipped out of Japan just shortly before the March 11th earthquake. See www.goldmarkart.com for more information. All to be paired with delicious wines from the Adnams collection. Our first blog. Finally we're getting into the 21st century. Lots of people phoning us recently trying to book a table at our non-existent restaurant. Have to tell them that we only do a 'to order' service but don't like to use the word takeaway. Tell each person that we can do anything from 'Supper for two' (our way saying 'High Quality Takeaway-But-You-Need-To-Order-On-Advance') to full catering. Suspect Stamford could not support a full Japanese restaurant but the enquiries are encouraging. So if ordering please give our sushi-sized business at least 48 hours notice (and if possible more) so we can fit in with your requirements!